In 1966 - pop music's finest era - and a bunch of ramshackle DJ's play rock & pop 24 hours a day, broadcasting from Radio Rock, an infamous pirate radio ship in the North Sea. On board arrives 18 year old Karl, who is instantly plunged into a series of hilarious and life-changing adventures and misadventures. His mother thought the boat would straighten him out - a spectacular mistake! 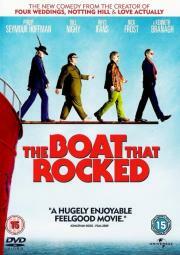 From Richard curtis (Blackadder, Four Weddings, Love Actually) THE BOAT THAT ROCKED is a brilliant comedy featuring some of the best pop music ever recorded and an all star cast lead by Philip Seymour Hoffman, Bill Nighy, Nick Frost, Rhys Ifans, Tom Sturridge & Kenneth Brannagh.